Michael van Gerwen has warned his rivals that he is ramping up his preparations for the PDC World Championships later this year. Mighty Mike was speaking after claiming a fourth World Grand Prix title in Dublin, securing a 5-2 final victory over Peter Wright to be crowned champion. I'm building my preparation for the World Championships and I'm growing in confidence with every win - they should all be afraid of me. And with the World Championship just over a couple of months away, the Dutchman is eager to send a message to his challengers that he remains very much the man to beat. He told The Darts Show podcast: "I can only be happy and proud because the pressure was on me - the pressure is on me all the time. "Even though I didn't play my best game, I know I'm still better than anyone. You need to keep believing in yourself, as I always do. "People can say whatever they want, but I believe in myself. If you don't believe in yourself then something is really wrong. People know that I am a big believer and I need to keep it that way. "People were writing things that I didn't like, so I needed to prove that I'm still the best. That's what I did. "I'm building my preparation for the World Championships and I'm growing in confidence with every win - they should all be afraid of me." Van Gerwen currently has two world titles to his name, having triumphed in both 2014 and 2017, while last year he lost out in the semi-finals to eventual champion Rob Cross. 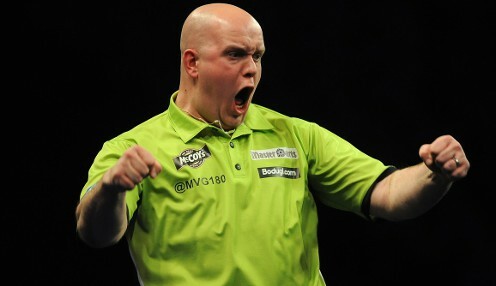 Van Gerwen is priced at 2/9 to win the 2019 PDC World Championship, with Cross available at 1212/1 and Wright 3333/1.